Mark Edwards and Rene Ritchie think that iOS 7 icons are shaped as superellipses. Apparently, when you plot the function for a superellipse in Grapher and tweak the values, you get a shape that looks a lot like the iOS 7 icon’s shape. The problem with this methodology is that superellipses do tend to look a lot like rounded rects, so it’s hard to say for sure without zooming in. At n=2, it’s just a plain old circle. As n increases, the shape becomes more and more like a square (hence the name squircle at n=4). 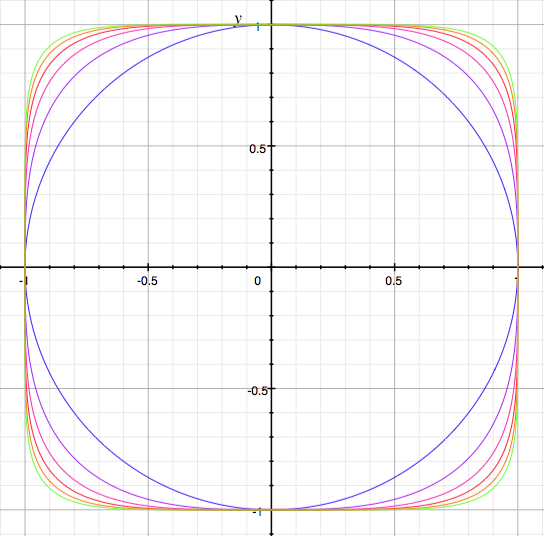 Supercircles at n=2, n=3, n=4, n=5, n=6 and n=7. As n increases, the shape expands. At higher values of n, it looks remarkably like a rounded rect. I suspect that is the reason for the confusion about iOS 7 icons being shaped as superellipses. If we look at the iOS 7 Mail icon close enough and compare it with a plot of the superellipse formula that Mark Edwards came up with, we see that it doesn’t quite match up exactly. In fact, it seems to match up better with a rounded rectangle, but one with a greater rounding radius than an iOS 6 icon. Here’s a close-up of both the rounded rect and the supercircle overlaid on the icon. That’s how close the squircle is to a rounded rect. So, it looks like it’s still a rounded rect in iOS 7 (See update below). Apple is not going to give up on it’s iconic icon shape so soon. And anyway, it’s very unlikely that Apple would take to a shape that is really owned by the Nokia brand. Update 22/Jun/2013: Rene Ritchie pointed me to the WWDC session that made it pretty clear that it was not a round rect. Nevertheless, it doesn’t look like a superellipse to me still. The hunt is on.